He faced a total of 14 charges at Edinburgh Sheriff Court, also including breach of the peace and indecent assault. The 64-year-old made no plea during the hearing and was released on bail. Outside court, Mr Salmond said he was “innocent of any criminality” and added that he would defend himself “to the utmost”. Police had been investigating following a Scottish government inquiry into complaints of sexual harassment against Mr Salmond. He arrived at the court shortly before 14:00 on Thursday for a short hearing, which took place in private. Speaking outside the court following the hearing, the former MP and MSP said: “Now that these proceedings, criminal proceedings, are live it is important to respect the court. No date has yet been fixed for the next hearing in the case. 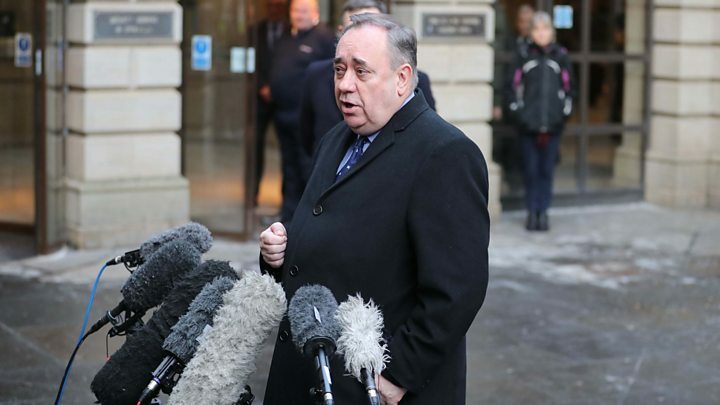 The news comes two weeks after Mr Salmond was at the Court of Session in Edinburgh, where the Scottish government conceded that its internal investigation of complaints against him was flawed.